Corporation is the world’s leading manufacturer of Measuring and Testing equipment which includes hand held Digital millimeters, Power Quality Tools, Scope Meter, Electrical testers, Indoor Air Quality, Process and Calibration Tools, Thermal Imaging cameras and temperature measurement equipment. The Hioki brand is distinguished by its Precision, Reliability, Convenience, Safety and Durability and is unmatched in the wide product range it offers. 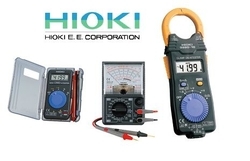 Hioki is the trusted brand used by the technicians, engineering and networking professionals across the world. Adex International is an authorized distributor of Hioki with operation in Dubai, Sharjah, Ajman, Ras Al Khaimah, Abu Dhabi and Alain. ADEX INTERNATIONAL LLC primarily focus on export of Hioki measuring and testing equipment to GCC countries like Saudi Arabia, Oman, Kuwait, Bahrain, Qatar and also African countries like Egypt, Lebanon, Sudan and Russian countries like Azerbaijan, Uzbekistan etc.